The video is shot like my @$$ though. Definitely does not give the send any justice. 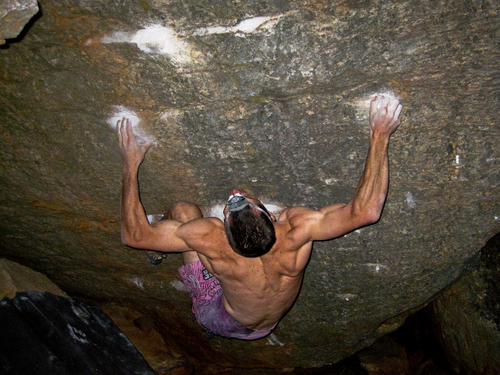 Steve Bradshaw making the 2nd known ascent of "The Arch" 8B in it's broken state in Rocklands. The line was originally opened by Fred Nicole at 8A but unfortunately lost some of it's holds over the years. The problem was re-climbed by Italian Christian Core at 8B and lay unrepeated in it's upgraded state until Steve's success on the line in the 2010 season. van Verlangekraal! Well done Steve! Thanks for the posts! Unfortunately, I was alone when I sent it and the only rock suitable for a fixed camera was behind that darn protea! But after Arjan's Spain film, I think videos are the way forward to share the psych so lets all keep filming! Right now he's at The Cauldron seeing if Ebola will go - due to the broken/missing grips (Steve pulled the grips off - That's how strong he is right now!! Looks like the man is on fire at the moment (in reference to the homepage pic)!! He's going to pull the whole crag down on top of himself and spoil it it for everyone!! Way to go strong man! !